Tanya Honig, Linguistics Department manager, has been selected as the 2009-10 UCSC Alumni Association and Staff Advisory Board Outstanding Staff Award recipient. 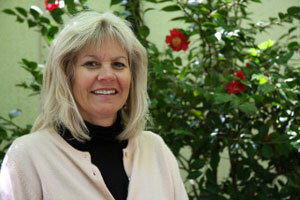 Honig has worked at UCSC for more than 35 years and has supported the Linguistics Department for a quarter century. One student said of Tanya, "... [she] is the glue that bonds faculty, graduate students, and undergrads into a cohesive and thriving unified department." Former dean of humanities and chair of linguistics, Professor Jorge Hankamer, wrote, "Tanya has been a major force in making our department what it is--one of the very best linguistics departments in the world." Established by the Alumni Association in 1995, the Outstanding Staff Award is presented annually to a staff member to recognize sustained, distinguished service by staff to student life, the growth and improvement of UCSC's programs, and the preservation of UCSCs unique intellectual and physical environment. This year will mark a new collaboration between the UCSC Alumni Association and the UCSC Staff Advisory Board in honoring the very best among our dedicated UCSC staff. The UCSC Linguistics Department has established the Tanya Honig Graduate Development Fund to honor Tanya, and to open new research opportunities for graduate students in the Linguistics Department whose academic performance is distinguished and who, like Tanya, have contributed significantly to the Department's life. For more information about the fund and how to contribute, please click here.